The Keep It Simple (KISS) philosophy is the primary focus of this book. It is written in very simple language with minimal math, as a compilation of helpful EMI troubleshooting hints. Its light-hearted tone is at odds with the extreme seriousness of most engineering reference works that become boring after a few pages. This text tells engineers what to do and how to do it. Only a basic knowledge of math, electronics, and a basic understanding of EMI/EMC are necessary to understand the concepts and circuits described. 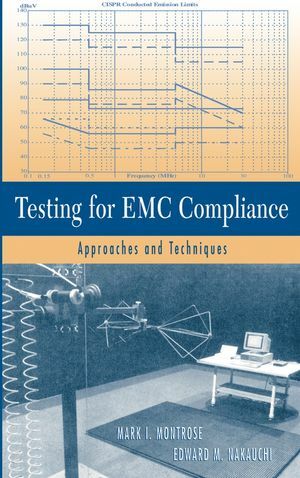 Once EMC troubleshooting is demystified, readers learn there are quick and simple techniques to solve complicated problems a key aspect of this book. Simple and inexpensive methods to resolve EMI issues are discussed to help generate unique ideas and methods for developing additional diagnostic tools and measurement procedures. An appendix on how to build probes is included. It can be a fun activity, even humorous at times with bizarre techniques (i.e., the sticky finger probe). MARK I. MONTROSE is an expert in the fields of regulatory compliance, electromagnetic compatibility (EMC) and product safety. He has performed extensive research in the areas of EMC theory and signal integrity, and has written numerous papers on the subjects. Mr. Montrose is also a Senior Member of the IEEE and a member of the Board of Directors of both the IEEE EMC and Product Safety Engineering Society, as well as an active participant in local, national, and international activities of both Societies. He has published two prior books related to EMC and printed circuit boards. EDWARD M. NAKAUCHI has over thirty years of experience in analog, power, and digital design and has spent the majority of the past twenty years working in the EMI/EMC/EMP and ESD areas for military aerospace companies as well as commercial audio, computer, and medical organizations. He has written numerous technical papers and magazine articles, and presented seminars on various EMI/EMP/ESD topics. He has also taught courses on EMI/EMC through the University of California Irvine Extension program. He is a NARTE certified EMC/ESD engineer and an IEEE Senior Member. 2. Electric, Magnetic, and Static Fields. 5. Probes, Antennas, and Support Equipment.